Sometimes I just don’t get these cards and I probably shouldn’t take them literally, but, heck, it’s more fun that way. When I was a youngster, I wanted to be a professional baseball player. When Cody Ross, professional baseball player, was growing up he wanted to be a rodeo clown. Do you know what rodeo clowns do? They distract bulls…purposefully…bulls that are intent on gorging….not exactly a profession a ton of people aspire to. I think the baseball community can thank their lucky stars that Ross found his way to the diamond instead of the rodeo. It wasn’t easy though. 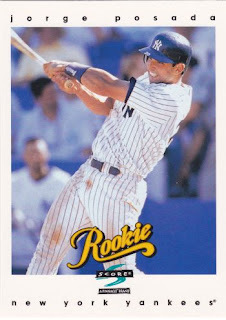 Ross, a fourth round draft pick in 1999, would post decent minor league numbers for the Tigers, ultimately hitting .287/.333/.515 at 22 in AAA. However, he’d net just 19 ABs (and one blown knee) for the major league club before they traded him to the Dodgers for Steve Coyler (who would pitch just 32 major league innings for the Tigers and post a 6.47 ERA) in April of 2004. Ross would do his thing in the minors for the Dodgers (.273/.328/.538) in 2004, but not see the majors until 2005. In 2005, he’d get just 25 ABs and do nothing special. Then, in 2006, he’d be traded by the Dodgers to the Reds for Ben Kozlowski (a career minor leaguer). However, a month later the Marlins would purchase Ross from the Reds. The Marlins, for whatever reason, decided to turn Ross loose. In 2006, he’d get 250 MLB ABs and post a miserable .212/.284/.396 slash line. But the Marlins would give him another 173 ABs in 2007 and Ross would destroy the ball (.335/.411/.635). Finally, at age 27, Ross was given a full season to operate and he didn’t disappoint: .260/.316/.488. Numbers most people would think were easily attainable based on his minor league track record. Ross has shown a penchant for slugging some homers and destroying lefties (career: .290/.351/.595). Two skills that have come in super handy during the 2010 play-offs –most notably when he singled off Jonny Venters to give the Giants the series victory over the Braves.